This was a special project created for a gallery who offers the art of well-known painters on painting palettes of all sizes and shapes for an annual Holiday exhibition and sale. 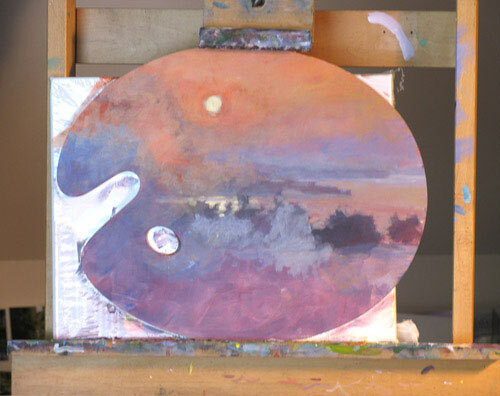 Before deciding on a subject to paint, I shopped for the palette. 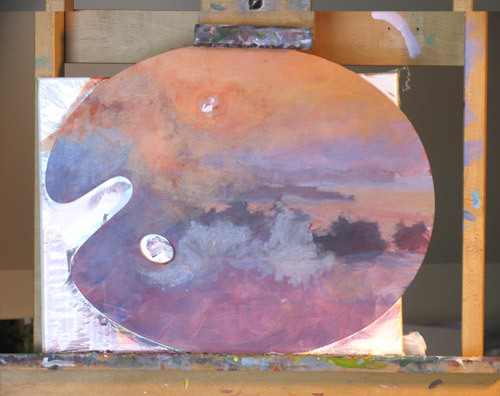 I chose a standard curved wooden palette approximately 15 x 20 inches. 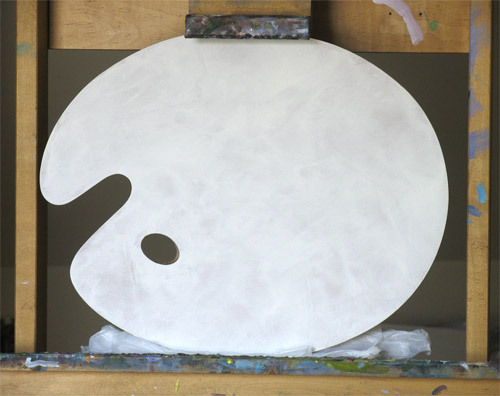 After lightly sanding one side of the palette, a coat of gesso was applied in random fashion. This offered a toothy ground for any media to hold well. Why did I choose this horizontal orientation? Primarily because the grip and thumb hole tend to look like a smiling fish when turned to the right. Whatever the subject painted, this "smile" could have been prominent and I did not want that to impact the painting. I will use acrylics as time is short - I did not want to send a wet painting to the gallery. 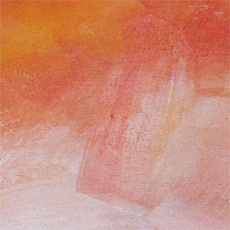 The painting will not be framed but rather be mounted on nice table easel so it can be displayed on a wall or tabletop. So with a quick spray of water to break the tension of the surface I first lay-in a preliminary sketch using Alizarin Crimson/Viridian mix. The board was not steady on my easel so you'll notice the support of another canvas behind it. 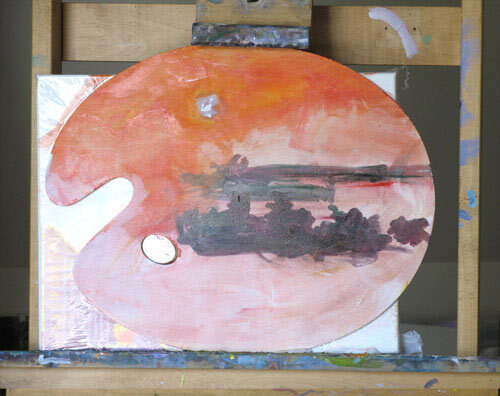 Before the first layer dried, I made a mixture of Cadmium Yellow Medium and Vermilion to fill-in the sky and a thinner application of paint for the rest of the surface. The bulk of the image will be violet and blue so I wanted to have a warmer underpainting to offer more a glow to this piece. This step may appear dramatic. 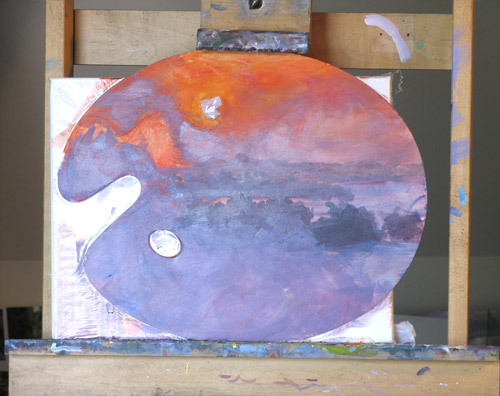 Simply put, I mixed Cobalt Blue and Alizarin Crimson to create a violet, heightened with a bit of white and the Vermilion/Yellow of the sky applied the back-most land masses. Then progressively lowered the value and added more blue for the middle land; and finally more blue and Alizarin for the closest islands in the middle-ground. 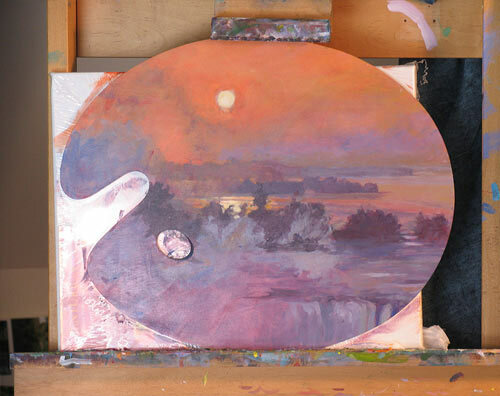 I further took the violet mixture and dropped-in what will be the misty water masses created by the falls on the left and bottom of the painting. With a thin veil of the same color, I lightly went over the right side of the sky and water below. I had to work quickly to maintain a painterly look. 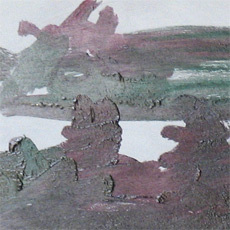 The paint at this point is still very thin. I did not want to commit too soon to the shapes and arrangement. If this had been a regular shaped canvas, the composition would have been easier. As you can see, the palette thumb hole is the greatest challenge facing me since I have a round sun to contend with. 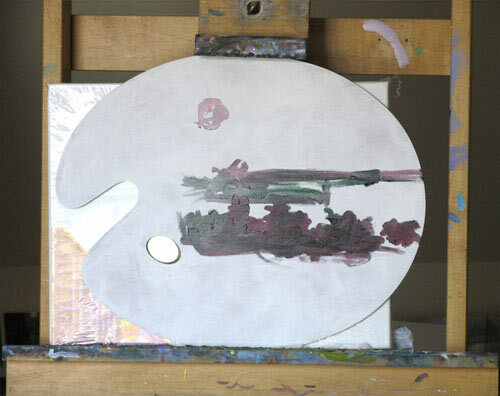 The paint will become thicker as I apply layers so have left the sun area white for the time being. Lots added here but still relatively thin paint. After allowing the previoius layer to dry I wanted to see how much darker the dried paint would be. It was substantially darker than expected. I proceeded to raise the values while continuing to build the painting. Started working the cloud formations that are coming up from the falls, worked the sky as well as the distant land masses once again as they were too strong as compared to the foreground. 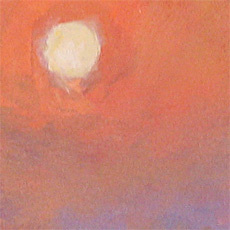 As you can see, this sunrise painting is a very low key piece. 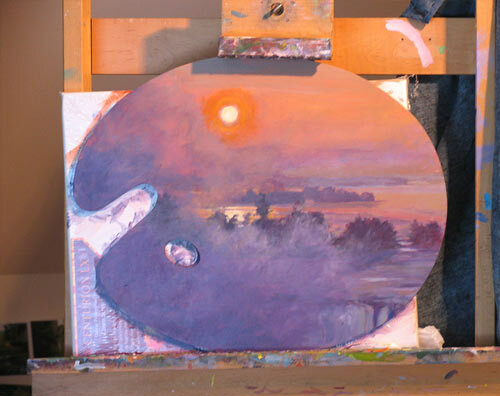 To really set the stage for balancing everything color-wise and value-wise I did a preliminary coat on the sun itself as well as in the water reflection. Now I could more easily compare the very close values and keep my darkest dark and lightest light as my standard. In review, until now, I have used just a few colors: Cobalt Blue, Alizarin Crimson, Vermilion, Viridian, Cad Yellow Medium and White. I want to use the fewest number of colors necessary to get the job done. Too many colors used in this particular piece will make it too spotty. 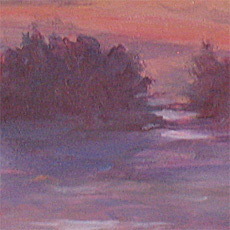 My objective is to create a vast landscape in a small space while maintaining a rich color harmony throughout. 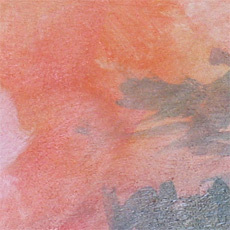 This painting is basically a complimentary color scheme...that being, orangy and bluish with nuances of reds, greens and yellows. Now that the surface is covered with everything in relative position, I can focus on bringing the painting to the next layer. From there I will finish the piece. In this image you can see particular work done to further build the distant land masses, and treed islands in the middle-ground, along with adding a hint of the Niagara Falls (far lower right). Without this, the final mist on lower and upper left will not make sense. I need to tell the viewer what is creating the mist. I also worked on the water as compared to the last photo. Additional work was done on the sun and it's reflection too. The sun had to be handled carefully. It was a cool yellowish white surrounded by heavy deep orange. I did not use straight white on the sun at all or it would look artificial. 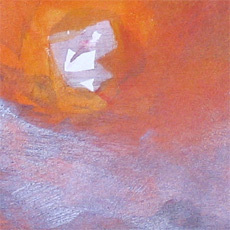 Therefore a mix of white, Cad Yellow Light was the base with a touch of Cad Yellow Med around the perimiter. I left the edges around the sun relatively soft otherwise it would look like a hole or pasted onto the surface. 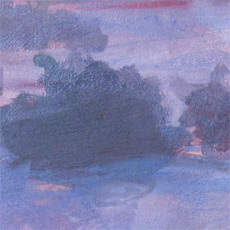 Moving to the bottom, upper and lower left, I further develop the mist by first laying the darkest-dark blue-violet building upward. I faintly add the sunlight hitting the top parts of the mist. 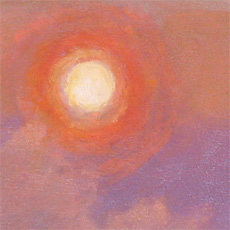 I also heightened the value of the top sky to a blue-gray-green and worked more intense colors around the sun. This will be toned-down a bit later. Final details. 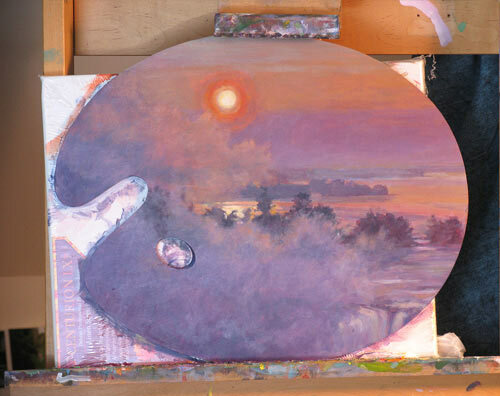 Working around the painting, I balanced the colors, temperatures and values to unify the whole piece. Also handled was the mist. 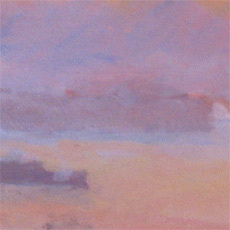 Can't overwork clouds or mist. I used a tiny bit of translucent glazing over the finest mist and re-emphasized the small indication of the top of the water falls in the lower right. The sun too, had to be handled carefully so as not to look "cute" or contrived. In keeping with the sun 's position, I moved it's reflections on the water to the left a little as it was not straight down like it should be. Around the middle-ground, treetops had to look more natural and not too hard-edged. Actually, the toughest area was the sky. 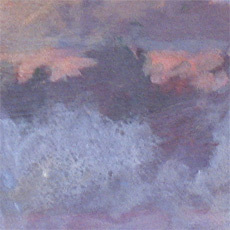 It had rapid vertical color shifts, although subtle, from top down to horizon. Going from a cool blue-green-gray at the top into muted orange (which can turn green if not careful) and into the cool lavender-gray at the horizon. 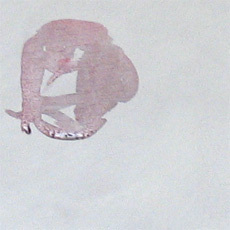 I varied my brush stroke direction so it did not appear like a different painting technique from the rest of the piece. Once fully dried, I used a satin acrylic varnish using a sponge brush, moving in different directions to add depth and textural difference. After a second coat, the piece was complete! 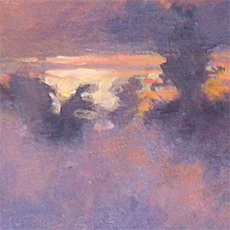 You can notice from the final detail photos that this painting does not have much detail — simply an impression of this sunrise. Hope you enjoyed this demonstration on a unique "canvas"!